Schäffer is presenting its new telescopic wheel loader, the 6680 T, at the Agritechnica 2015. This strengthens the loader specialist’s market position as the supplier with the broadest range of articulated telescopic wheel loaders in the world. Particularly eye-catching: the new design of the rear section, which underscores the powerful dynamics of this vehicle. With a working weight of 5.6 t to 6.3 t, the new 6680 T occupies the middle segment in Schäffer’s product portfolio. The structural change in agriculture constantly brings new logistical challenges, such as bale stacking at great heights and the loading of large mixer wagons. The 6680 T offers the best prerequisites for this. The drive has been completely updated since its predecessor. As well as new axles, the High Traction Force drive system (HTF) also contains a high-performance variable displacement pump with a higher operating pressure and improved efficiency. This has increased its thrust power by 20 %. 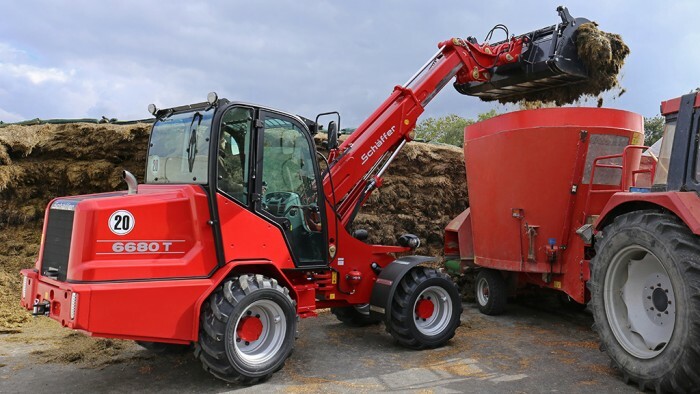 The new loader is driven by a 55 kW (75 HP) Deutz turbo diesel engine of the latest generation, and complies with emission standard IIIB. It uses a diesel oxidation catalyst that eliminates the need for a diesel particle filter. Because all the components in the hydrostatic drive are perfectly matched to each other, the fuel consumption is converted into performance economically and effectively. The maximum driving speed is optionally up to 35 km/h, so even interplant uses can easily be handled. The maintenance-free articulated steering makes the loader more manoeuvrable than any front loader tractor. The inner turning circle is only 1.75 m, and the rear swing axle provides excellent ground following and stability. The maximum lifting height of the new telescopic wheel loader is 4.90 m. The telescopic arm contains “Ferro-Form” sliding elements. In contrast to other, more usual plastic elements, this material is very low-wear, and there is no need for constant lubricating. The cabin has also been improved. The vehicle has the “SCV” (Silence / Comfort / View) cabin that is otherwise only seen in the larger models. The advantage: this vehicle sets new standards in its class in terms of driving ergonomics, space and all-round visibility. A higher version that provides the driver with an even better view is also available. Schäffer is also presenting other innovations at the Agritechnica 2015. The specialist for yard, wheel and telescopic loaders will be found in Hall 6, Stand B15. For more information, please visit http://www.schaeffer-lader.de.